Bob In Timor-Leste | An account of life and work in the Pacific. Fast forward a few months, and I am back in Washington DC, sitting by the fire on a colder-than-usual spring afternoon. I returned from Timor-Leste in late December, and am missing the warm trade winds, even though this is the rainy season in Timor-Leste. Warm and wet feels much better than cold and damp. I began working in development in 1966 as a Peace Corps Volunteer on the small island of Rota, in the Mariana Islands of what was then Micronesia. As I left for Timor-Leste last year, it seemed entirely fitting that I end my career on another small island, forty-some years later. My intention was to return to the US from Timor-Leste and retire, perhaps starting another career, perhaps not. But when I left, I had not counted on returning to a world in the grip of economic chaos. All-in-all, it seemed an inopportune time to retire. So, I am back working at headquarters, same as before, but significantly different. Timor-Leste has not been far from my mind. With all its difficulties and quirks, joys and miseries it is a wonderful country and I miss it. And I miss colleagues and friends. It has occurred to me that over the last forty years, I have said goodbye in too many places, and to too many people I cherish. It is hard to pour energy and emotion into a place and just let it go when you leave. I hope to go back to Timor-Leste periodically, knowing of course that it will not be the same. Next month, I will be in Liberia, doing a study to find culturally (and nutritionally) suitable alternatives to the hunting and consumption of endangered forest animals, a main source of protein for forest-dwelling people. It is a fascinating topic, one that will be very engaging over the next few months. The field work will take me far into the bush (forest animals hunted for food are collectively called “Bushmeat”). Then I’ll have to leave. So it goes. Surrounded as it is with an abundant sea, and endowed with spectacular beauty, it is all too easy to forget that Timor-Leste is the poorest country in Asia. A recent report by the UN’s Fund for Population Activities (UNFPA) is enough to grab the attention of even the most oblivious. With one of the highest fertility rates in the world, Timor-Leste also has some of the world;s most dismal survival rates for both mothers and their children. The under-five mortality rate is 130 per 1,000 live births; maternal mortality is estimated at somewhere between 660 and 880 deaths per 100,000 live births. An estimate from 2003 shows the average Timorese woman has 7.8 children in her reproductive life. Extrapolating from these data means that the risk of death for the mother during pregnancy is 1 in 16. Ninety percent of all deliveries are at home, and less than 20% of all births are attended by a skilled health professional. The litany of misfortune goes on and on, much of it driven by poverty and ignorance – a bit over half of women and just over 40% of men are illiterate. Dependency rates are very high, with only about 36.6% of the population making up the labor force. Statistics only punctuate the story. The real story can be read in the faces of men and women older than their years, and the skinny little bodies of kids with not enought to eat. Paradise? Not for many. One morning earlier in the week, I went out on the beach with a cup of coffee to see if anything interesting had washed up onto the beach. As I sat there, I saw a huge black bird hoving high above me, drifting effortlessly on the air currents. He resembled a huge ‘W’, with narrow wings and a long tapering tail. Guessing it was a Frigate bird, I looked it up on Wikipedia, which confirmed the guess. Later that afternoon, I walked along the beach with my binoculars, and was rewarded with the sight of four birds, cruising along the shoreline. According to Wikipedia, Frigate birds do not have oily feathers, and mostly stay out of the water. They cannot take off from the water, and have short stubby legs, making them ungainly on land. What they can do is fly, and fly and fly, sometimes staying aloft for up to a week at a time, gliding on air currents on a wingspan that can reach two and a half meters. They commonly catch flying fish in the air, and are skilled at intimidating other sea birds and stealing their catch. Frigate birds do not migrate, and I am hopeful that these have taken up residence in my part of the north coast. There is a nesting pair of Osprey (Sea Hawks) nearby, and it will be interesting to see if they can all manage to share sea and sky. Most evenings, I get back to my cabin at about 6:30, and position myself with a drink in my hammock to watch the sun set and wait for the stars to emerge. My hammock faces southwest, providing a view of the sunset, and later, the Southern Cross high in the southern sky (I actually have two hammocks – the other faces northwest, for a better view of the sea). Last night was a particularly beautiful sunset, and the night sky was absolutely clear, complements of the northeasterly trades, which had been blowing about twenty knots all afternoon. I am far from an expert on the stars, and can pick out only a handful of constellations – the ones we see in the northern hemisphere appear upside down in the southern sky – including Orion and the Big Dipper and maybe a few others if they are pointed out to me. But I had heard about software called “Stellarium” that is available for free on the web. I downloaded it, and am learning how to navigate with it around the night sky. The program automatically coordinates with the time and date on the computer, and when you supply the geographic coordinates, it gives you wonderful maps of the stars and planets, including variations on the constellations ranging from a simple outline of the stars to elegant artists’ renditions of them. It also provides details on individual stars, naming them and indicating their distance from the Earth. It is a stunning resource for stargazing. I have a lot to learn about the various features of the program. I did find a “red” switch, that can be used when outside so the viewer’s night vision isn’t ruined. So last night I took my laptop out on the deck, settled in my hammock and skidded my cursor around the southern sky. I was awestruck. I may never sleep again. Last Sunday I joined a group of eight divers and two guides for a diving trip to Atauro island, the small island 30 kilometers north of “mainland” Timor-Leste. Atauro was used by the Indonesians as a prison during the occupation, and the few residents there now are largely families who, after as long as twenty-five years, elected to stay after the occupation ended in 1999. The side of the island facing Dili has a mostly rocky shoreline, and steep inclines down to the water. Like the rest of Timor-Leste, Atauro is mountainous, with few villages and only a few kilometers of dirt road. We were headed for the other side of Atauro, facing away from Timor island, where there are rocky beaches and a spectacular reef wall. The dive boat, a powerful twin-engined craft, was outfitted to accommodate ten divers and their equipment. The skipper, an Australian expat, appropriately named “Rocket” (don’t call him Rodney, his given name) is an expert dive boat pilot, skilled at following divers’ bubbles during “drift dives,” where the divers drift along with the current as it flows laterally along the reef. Shortly after casting off in Dili, Rocket discovered that we did not have a shade fly for the open area at the stern half of the boat. So he stopped alongside a schooner moored in the bay to borrow one from the skipper, another Aussie expat who lives on his boat. The two skippers exchanges pleasantries, a fly changed hands, they got caught up on the day’s events, and they apparently wished each other a good day. In the entire verbal exchange, the only word I understood was “mate,” which constituted a frequent and no doubt important part of the dialogue. That done, off we went for Atauro. The sea between Timor island and Atauro can get rough, with whitecaps picked up by the northeasterly trade winds. 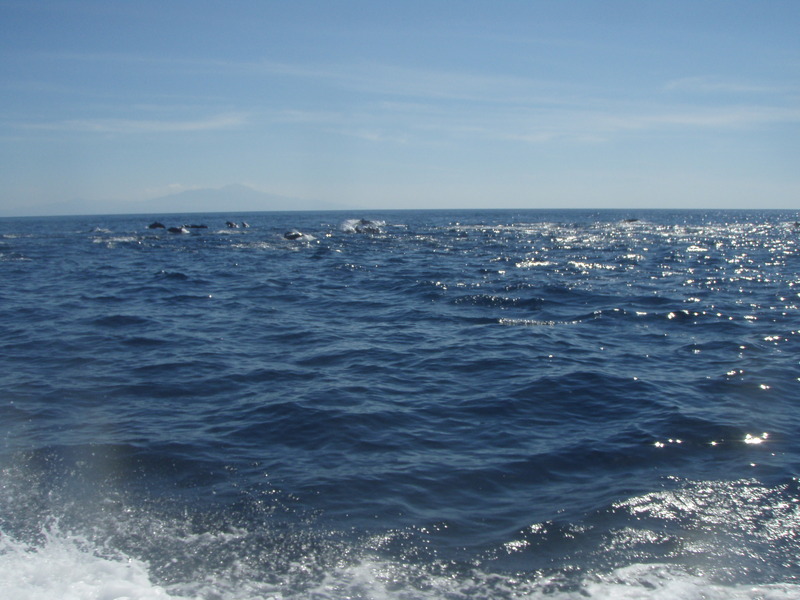 The channel between is very deep, about 3,800 meters, and dolphins and pilot whales are regularly sighted there. The roughest part of the sea is in the middle third of the passage – Rocket’s domain. He blasted the boat through the waves with obvious skill and satisfaction, crashing into the troughs with purpose, sending sheets of seawater shooting off the bow and directly into my face, having had the lack of foresight to choose a seat amidship on the windward side. As we approached the leeward side of the island, the sea flattened, my stomach muscles relaxed, and I began assembling my gear. The dive boat does not seem crowded with ten people aboard when all the gear is stowed. But ten people struggling to put on wetsuits and tanks gets a bit chaotic in a confined space, and it was mildly surprising to me that no one was poked in the eye or went overboard in the effort. Taking a breather with my wetsuit half on, I looked ahead to a large patch of water that looked like boiling seawater. As we approached, the churning water turned out to be a huge school of dolphins. There were so many animals it almost seemed like you could walk on their backs across the water. Rocket looped the boat around to give us a better view; and the dolphins seemed to be watching us as they swam and jumped in graceful arcs alongside the boat. Rocket dropped us off at the mouth of a small cove, and after coordinating signals among the divers, we descended on the ocean side of a huge reef wall. The wall was like a cliff, extending sharply downward from about 10 meters below the surface to an unknown depth. At 20 meters, I could not see the bottom. I imagined dark shapes in the darkness below – an uneasy feeling. The reef was a very dramatic spectacle, a vertical coral wall festooned with soft colorful corals and teeming with fish. We drifted along at a depth of about 20 meters, taking in the breathtaking scenery, until we surfaced next to the boat. I swam ashore after the first dive, and dozed in the sun for the requisite hour to allow accumulated nitrogen from the first dive to dissipate from my body. The second dive was equally beautiful, but different. The reef at the second site was more spread out, with coral heads extending up from a steeply sloping sandy bottom. The corals were more vibrant here, because the sunlight was not obscured by a reef wall. On the passage back to Dili we passed the school of dolphins again, and weaved in and out of the school for a closer look at them. I stayed drier on the return, having chosen a seat on the leeward side of the boat. A profound tragedy happened to a colleague and friend last week. As his family was gathered in his home celebrating his birthday, they were notified that his 16 year old son had been in a serious motorcycle crash. The boy suffered massive head trauma, far beyond the medical capabilities available in Timor-Leste, and died several hours later. I attended the funeral, which included a procession following the casket from the Catholic church in Balide, near my office, to the Santa Cruz Cemetery, the site of the infamous 1991 massacre by the Indonesians that accelerated the end of the Indonesian occupation of Timor-Leste. There were hundreds of mourners, many of them young people wearing their school uniforms. Many were weeping, a few fainted. Inside the walled cemetery, we stood in the hot afternoon sun as a priest said a few words, none of which I could hear, and hymns were sung. It had rained briefly an hour earlier, and the humid residue added to the misery. As we stood there, candles were passed around person-to-person. At the conclusion of the official part of the funeral, by custom, mourners threaded their way through the crowd and approached the casket, adding their candles to the growing fire beside the casket. The stricken family stood by the casket and received condolences from all who wished to express them. My friend, a dignified man in middle age, stood sweating in the hot sun and the heat from the fire of hundreds of candles next to his son’s grave, his face taut in a brave effort to keep his composure; the boy’s mother was inconsolable. I took his hand and mumbled something about how sorry I was, and joined the largely silent crowd leaving the cemetery back toward town. I do not know how long the family stayed by the grave. Those of us who survived the teenage years, and those of us lucky enough to have children who survived them as well, may forget how fragile teenagers are. It only takes an experience like this to remember. In spite of myself, as I stood in the cemetery I was struck by a grim metaphor of the cemetery and land and property issues that have come to be such a contentious part of traditional Timorese culture. 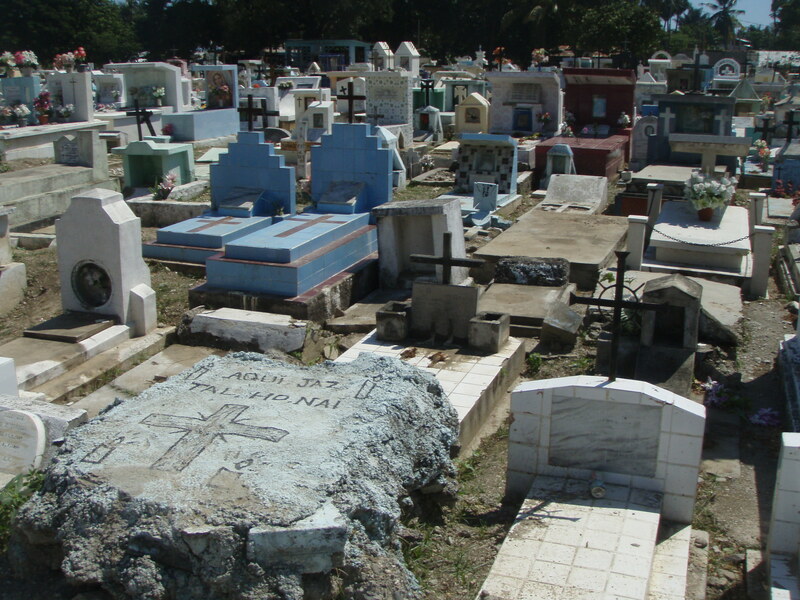 The cemetery is not partitioned into grave sites, with orderly pathways, gardens and other facilities. It is simply a walled space, where families dig graves for their loved ones wherever they find a vacant piece of land big enough and not already occupied by a grave. So is is a jumble of graves, with stone or cement vaults haphazadley placed throughout. It is nearly impossible to walk through the cemetery without having to climb over or around various graves and tombstones. It is hard to imagine space for even one more burial. The graves also tell a story of hardship: many are children, some have pictures cemented into the face of the tomb, showing worn, thin, serious faces. Considering its history and its accumulated sorrows, the Santa Cruz Cemetery seems to me a tragic place, and not one of poignant reflection. Timor-Leste is now solidly in the Austral winter, with clear skies, cool early mornings and hot, sunny afternoons. It is harvest time, and the markets are full of vegetables and fruits, and coffee is being harvested in the mountains. Last weekend, a friend and I rode up into the mountains of the Ermera District, where some of the best Timorese coffee is grown. The “road” up to the far reaches of Ermera is barely a road at all. 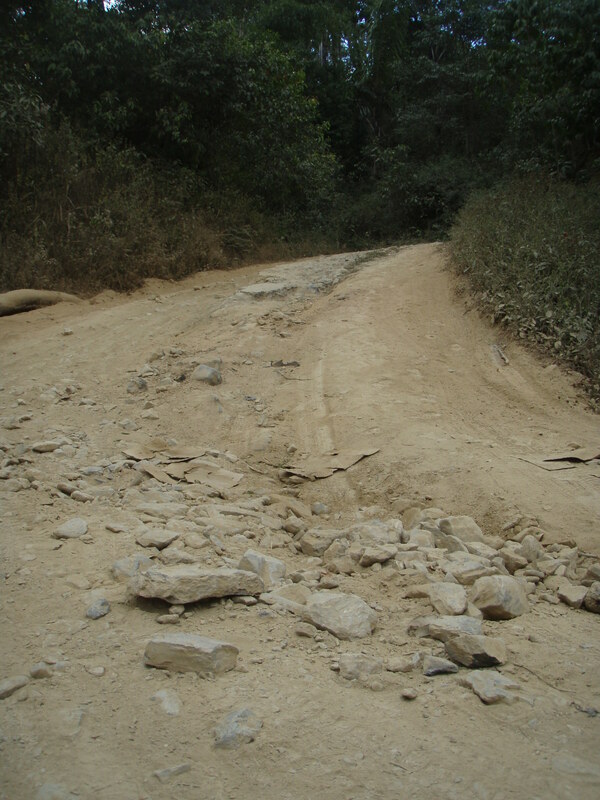 There are stretches, especially in the steep switchbacks, that are washed out and deeply rutted and full of large, loose stones. At times, I was not sure I could get up some of the slopes, even on a motorcycle. It is hard to imagine trucks getting up and down the road carrying coffee to processing stations – but they do. Farmers spread their coffee beans on mats in front of their houses, and even on the road, to dry in the sun (and providing yet another challenge to driving on the road). As we rode over the top of the mountain and began to decend, we were riding through a cloud. The scenery into the mountains is stunning. Poinsettias, hibiscus, bougainvillea, oleander and ground flowers that look like daisies and other wildflowers grow in profusion here, and all are blooming furiously. In places, the road is lined with bright red blooms of poinsettias and hibiscus. Small, wild orchids also grow in the mountains, although I haven’t seen them. The road skirts beautiful alpine meadows, where there is paddy rice and vegetable cultivation. We stopped along the way to buy a few bananas and tangerines at small stands by the side of the road, usually manned by children. After seven hours of bucketing up and down the mountains, we finally hit the beach road and rode back to Dili. 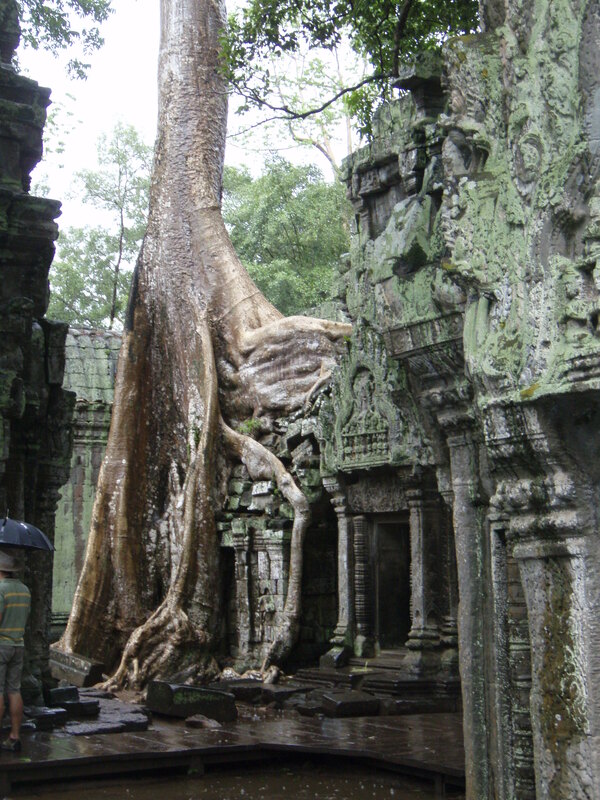 We took a bus for the five-hour trip to Siem Reap, and spent the next four days touring Angkor Wat and the other ancient temple complexes around it. We alternated between being awed by the spectacular ruins and antiquities, and horrified by the more recent history of violence and brutality. Outside Siem Reap, we visited the “Killing Fields” and “S-21,” the former high school converted by the Khmer Rouge into an interrogation and torture center; and also went to the land mine museum, and the wonderful new National Museum in Siem Reap. The National Museum is a jewel – beautifully designed and appointed. We intended to spend an hour there, and stayed three. In Phnom Pehn, we had eaten dinner at a restaurant operated by a Cambodian NGO as a training center for street kids and orphans to teach them how to work in the growing services industry. We were so impressed, we went to their other restaurant in Siem Reap. I confess that my entre was a little gritty, disturbing under the circumstances, but what’s a little grit in a good cause? We had hoped to take a boat down the river to Phnom Penh, but the river was too low in places, as it is just at the end of the dry season. We also had wanted to take a hot air balloon over Angkor Wat, But the flight was cancelled at the last minute because of impending bad weather. Back in Phnom Penh, we went back to see a few things, and took a boat up the Mekong River to see the city from the river, and see a small, family-owned weaving shop on the far bank. I took pictures of their baby, which Susan will send to them. My granddaughter Sabina is probably too little to know very much about lions, much less lionfish; although at two, she knows an astonishing number of things. 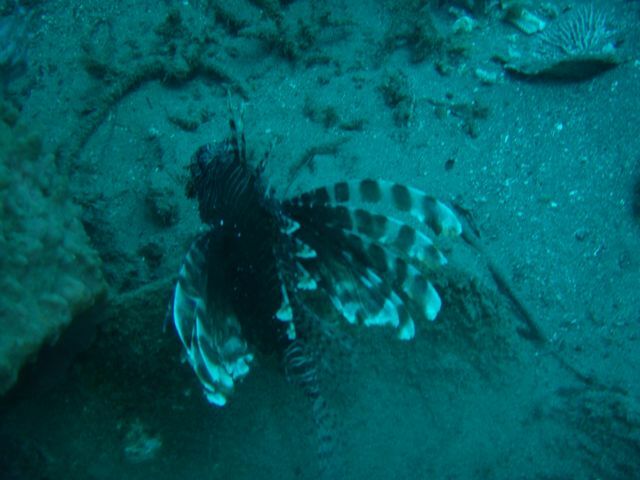 I want to show her a lionfish. I saw this fellow at a depth of 16 meters, peeking out from under a big barrel sponge. I laid on the ocean floor with my camera ready, hoping he would come out. I could see his “mane” under the sponge, but he didn’t seem interested in posing for a picture. I cautiously waved my hand in front of the opening – cautiously because the feathery fins pack a poisonous punch if touched. He came out, and obliged me by staying still long enough for a picture. Sabina, do you suppose he can roar like the other kind of lion? On this dive, I found the depth limit of my little camera. At 28 meters, the sliding lens cover refused to budge from the pressure. Next time I will open it at a shallower depth before descending.